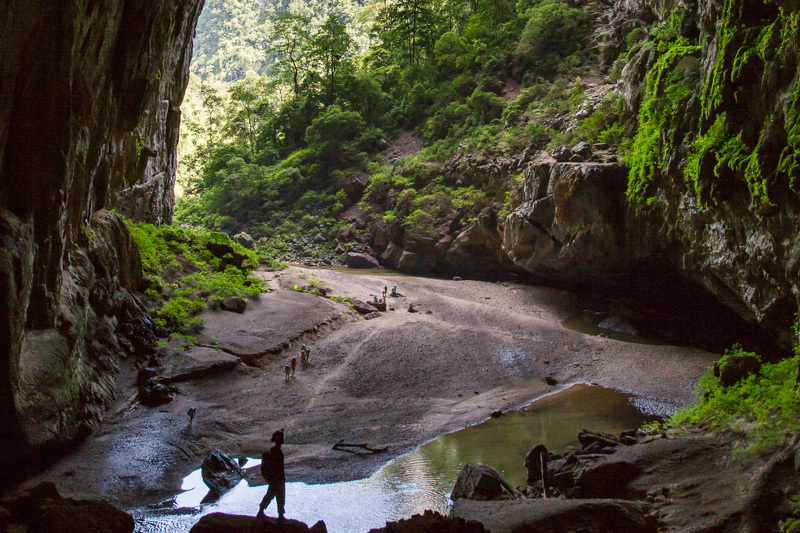 Come and explore Hang En and Hang Lanh Caves, located within the Phong Nha – Ke Bang National Park. 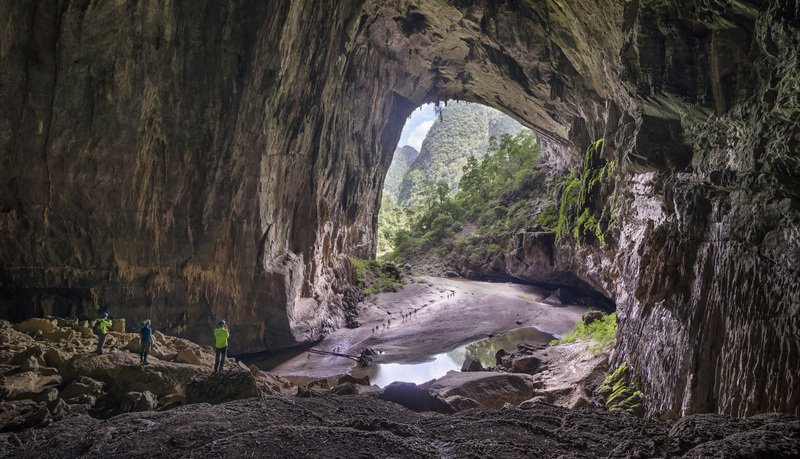 Hang En is one of our famous caves that have been featured within National Geographic, The New York Times, and recently on Good Morning America, as well as in Pan (2015), a film by Warner Bros. Entertainment (Hollywood). This tour will give you the opportunity to experience caving, trekking, and camping in the middle of the jungle! 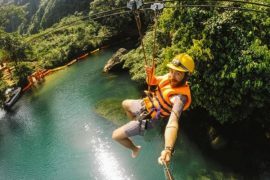 We provide the very best adventure experiences with every aspect of the trip carefully planned including delicious meals, the highest safety standards, and friendly and informative adventure guides. 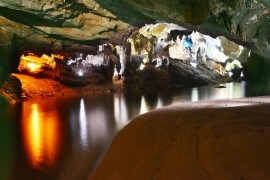 You will see both Hang En and Hang Lanh Caves during this 2 day, 1 night adventure. 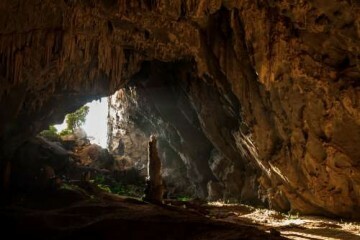 Along the way, your guide will inform you about cave formation and the geology of the region. Your tour will wind through jungle, across streams, into two massive caves, and past a minority village, all situated within one of the prettiest national parks in the country. Hang En Cave is most likely the 3rd largest cave in the entire world, and it’s one of our best selling products for a reason. Come and experience what has been dubbed by one Lonely Planet author as the biggest WOW factor in Vietnam. DEPARTURE/RETURN LOCATION Dong Hoi, Phong Nha, Ho Chi Minh Trail, Doong Village, Swallow cave. DEPARTURE TIME Pickup time from 7h00 am to 7h30 am in Dong Hoi city. 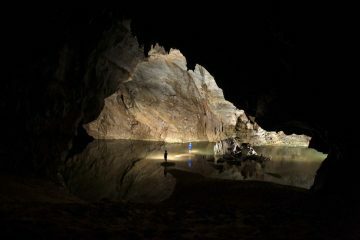 Start your ultimate adventure with a pickup from your hotel in Dong Hoi around 7:00am (or in Phong Nha around 8:00 am)am and a short transfer to the office at Phong Nha. Learn all about safety, collect your gear, and sign our Release Form before driving 45 mins through the National Park to reach the trailhead around 10:00 am. 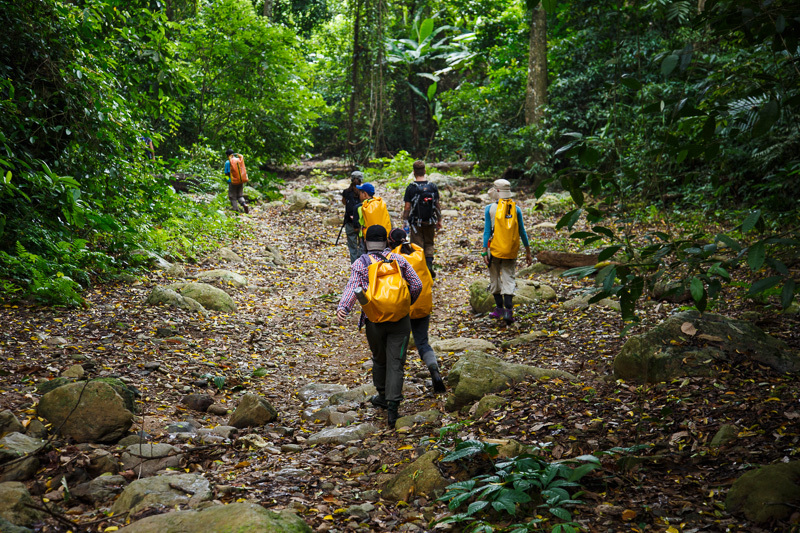 The next three hours will take you on a trek down through the jungle and across Rao Thuong Valley. You’ll stop for a picnic lunch from about 1:00 – 1:30 pm to gain your energy for the next hour and a half’s journey to Hang Lanh. 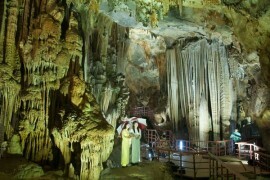 From 3:30 – 5:30 pm, the group will venture into Hang Lanh and explore the first kilometer of the 4 km long cave. 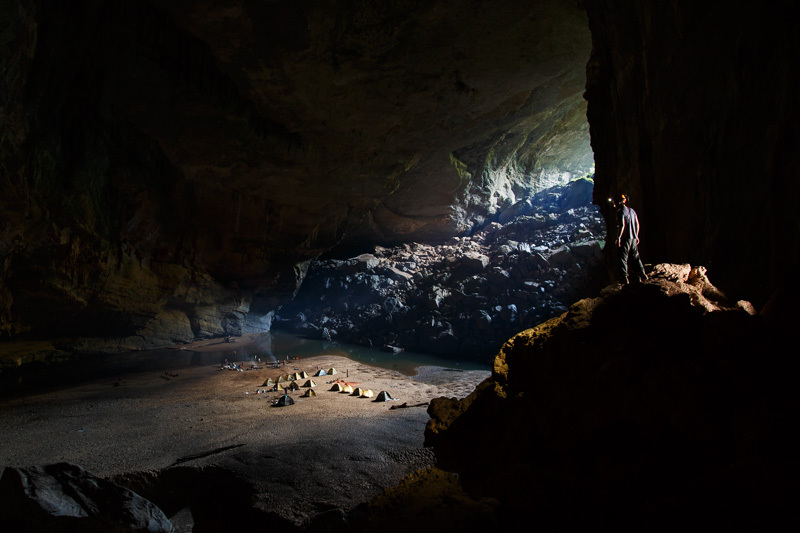 Hang Lanh is an active stream cave, with cold water running through it, and it is well decorated with stalagmite and stalactite formations. Rare fossils can be found in many places! Back at camp, you’ll have time to relax before a sizzling grilled dinner is served, complete with rice wine and the sounds of the surrounding jungle. Sleep under the trees and the stars, and rest up for Hang En the following day. Awake at 8:00 am for breakfast and pack up your belongings. Depart camp at 9:00 and trek to the entrance of Hang En. The entrance seems small for such a large cave which lies ahead; as you make your way to the main passage of the cave, you’ll be astounded by the view. From 9:30 am – 12:00 pm, you’ll explore Hang En: the cliffs above the beach, ancient fossils, and of course, the exit, which was featured in the film Pan. 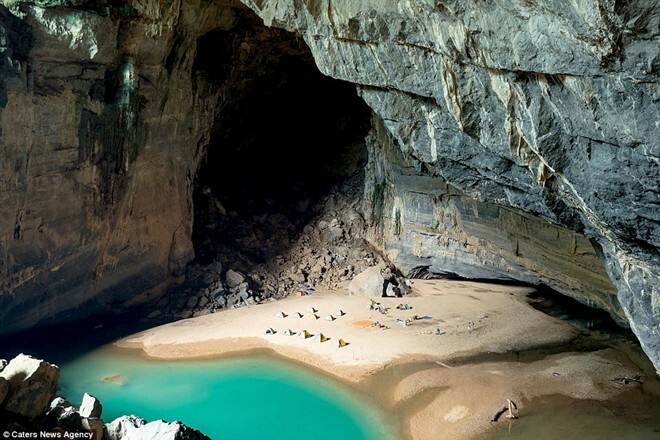 After your exploration of the cave, you’ll have lunch on the beach within the cave while soaking up your surroundings. For the following few hours, make your way back through the mountainous river valley, through jungle and across streams, until reaching the minority village, Ban Doong, around 2:00 pm. Spend about 30 mins getting to know the elders of Ban Doong and then continue on. Enjoy a water break by the stream as you prepare for the biggest challenge ahead, climbing the treacherous hill up to the Ho Chi Minh Road. Watch out for leeches and push ahead to the road, where cold drinks are waiting. Return by vehicle to Phong Nha by 5:30 pm. We booked our Hang En 2 day 1 night adventure tour with Netin. 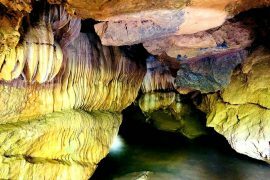 If you have any troubles finding reviews for this trek through different companies, it is because most overnight cave tours are pretty much run exclusively by Oxalis. The other companies will provide you with transfers etc but if you want reviews for the trek itself go look at Oxalis. As for Netin, we chose this company as they have the most competitive price and included all transfers where other companies were going to charge us big bucks. They picked us up from our hotel in Dong Hoi, dropped us to the trek at Oxalis (about 50k from Dong Hoi), and picked us up as soon as we got back from the caves the next day. Our guide was so lovely: she sang traditional Vietnamese songs on the way to Phong nha, gave lots of interesting information about the areas, let us have a quick shower after our trek (it was in her best interest after a 2 day hike!! haha) , she also helped us to organise our train tickets at the train station. If you plan to base yourself in Dong Hoi, then Netin is a safe bet!